Short Product Description: A refreshing, clean blend of fresh rose petals, wisteria and cyclamen, with soft notes of sweet sandalwood and musk. This is an old time favorite that will never go out of style. A refreshing, clean blend of fresh rose petals, wisteria and cyclamen, with soft notes of sweet sandalwood and musk. This is an old time favorite that will never go out of style. 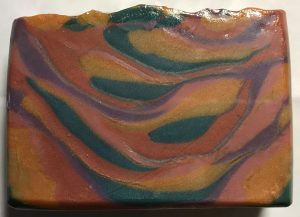 Handmade soap with a balance blend of Lavender oil, Chamomile oil and Neroli oil topped off with a sprinkling of lavender buds. The pop of yellow is reminiscent of a perfect day in the sunshine surround by a field of lavender buds. 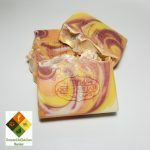 All natural lathering sea salt soap is luxury soap great for any time of the year. Having sea salt in your soap gives the soap a wonderful lather that feels like you have lathered up with lotion before the rinse. It’s not scratchy at all but leaves your skin feeling nice and smooth.